Outdoor lighting adds beauty and depth to your home at night.It can also be an integral part of your home security system. Outdoor security lighting keeps your home secure by discouraging trespassers and intruders. With more light, there is more chance of being recognized or caught. That’s enough to keep most criminals at bay. The most common type of burglary is privately owned single unit home invasion. In fact, 88% of all burglaries in America are residential. In absolute numbers, the U.S. Department of Justice estimates that 3.7 million household burglaries take place every year. However, it’s not hard to avoid this kind of crime. In general, criminals tend to look for the easiest targets. What that means is that you don’t have to have a fortress, you just have to be a less desirable target than other homes in the area. 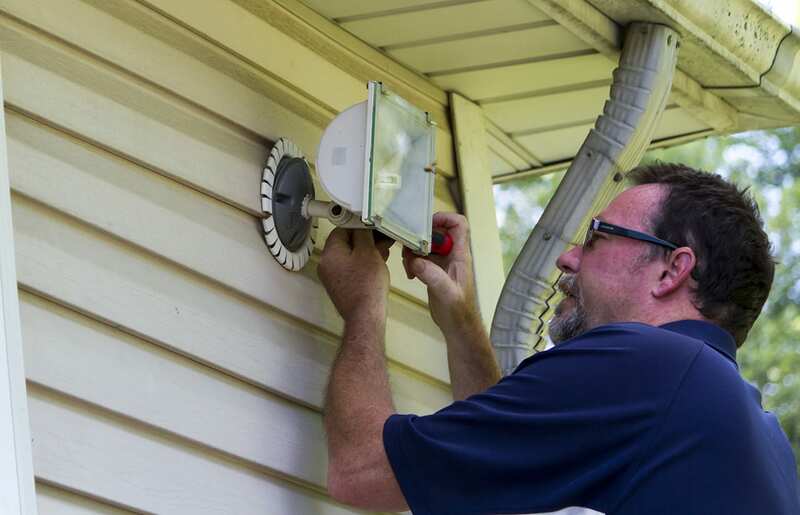 One way to make your home a less desirable target is to make it less safe for prowlers and invaders. A home that has adequate lighting increases a burglar’s chances of being recognized or caught. In most cases, criminals don’t want to take that chance, and so they will pass by your home in favor of an easier target. Your home doesn’t have to be awash in bright lights to be secure. In fact, too much light can do harm, highlighting high-value items that could be of interest to burglars. An overabundance of light is also likely to cause light trespass and light pollution, both undesirable to your neighbors and the environment. Instead, the best lighting for security is lighting that covers key areas to make it hard for criminals to approach your home unnoticed. There are two main types of security measures you can take to protect your home. Active Security Measures – These are components of a security system that respond to the behavior of criminals or anyone approaching your home. These can include alarm systems, entryways that use a card or a code to gain entrance, and monitored closed-circuit video surveillance. (If a surveillance system is not monitored, it is not responsive and would be considered a passive security measure.) Lights that are motion-activated are also active measures because they respond to the behavior of people around them. Passive Security Measures – These components do not respond to the behavior of the people around them but serve a constant function as part of a security system. These include such basic components as walls, fences, and locked gates. Warning signs that indicate active measures, like an alarm system, are also passive measures. Lights that remain illuminated around your home and property all night long are passive measures. They increase security without any direct interaction with human behavior. The best security systems include both active and passive elements. The goal of any security system is to scare off would-be criminals before they approach. That is much more preferable than catching criminals in the act or after the fact. Employing both types of security measures makes a home to risky of a target for most criminals. The majority of criminals will look elsewhere for easier targets. Before you can effectively plan out the security aspect of your home lighting, you need to know your risks. Do a quick walkaround of your property. Look for high-value items that are particularly appealing to criminals. These could include vehicles, statues or artwork outdoors, and expensive lawn ornaments. Make sure that vehicles are kept out of sight in a garage, and that lawn art and ornaments are secured in place. A common mistake homeowners make is to leave ladders or other tools, like hammers and screwdrivers, outdoors. These tools would easily be used by criminals to gain access to your home, so make sure they are kept indoors and locked up. Stroll around your property at different times of day, taking note of areas a burglar could find shelter. Look for hiding spots behind large trees, sheds, or other landscape features. Look around at night for deep shadows and dark areas that could provide cover for would-be home invaders. Take note of these areas so they can be adequately lit once you install your security lighting. You should also take into account security features and risks from outside your property. If your property abuts a vacant lot, a playground, or a forested area, these could all be places a criminal could hide. If your street is lit with street lights or light from other buildings, incorporate that light into your security plan. Many local police departments will do a complimentary walk-through of your property to help you identify security risks. Floodlights shine a wide cone of light over a large area. They can be used both for security and decoration. Floodlights are commonly used as wash lights to provide an overall glow to the facade of a home. They can also be placed by driveways, backyards, loading areas, walkways, decks, patios, corners, or other dark areas. Often a flood light would provide too much light for decorative purposes. In those cases, a floodlight can be set with a motion sensor that will light up a large area if someone tries to approach. Path lighting is, as its name suggested, mainly for lighting paths. That’s no surprise. But it doesn’t need to be entirely utilitarian. Good path lighting increases safety and security by minimizing trips and falls on the way to an entrance or through a garden. But when used judiciously, path lighting can create pools of light highlighting small features or a garden, drawing the person walking the path from light to light. These would include something like a lamp post closer to the street. While some neighborhoods may have municipal lighting on the streets, smaller decorative lamps can be installed in addition to or in place of street lighting. These lights can provide the first line of defense against an unwelcome visitor. Be sure to choose a fixture that directs its light downward to avoid light trespass and light pollution. Surface and post luminaires are very similar. They are both smaller fixtures affixed to the outside of your home. Surface luminaires are placed directly against the wall, while post luminaires stick out from the wall, like a typical porch lamp. These can be used on porches, patios, and decks and near entrances to welcome guests and ward off unwanted visitors. They are often part of a decorative lighting scheme, as well. Outdoor security lighting should be incorporated into your overall home and landscape lighting design. You want to avoid making your home look too much like a commercial property that is just brightly lit to discourage trespassers. Security lighting can be worked into a landscape lighting design with a combination of motion-activated and timer-activated lights. Night Vision Outdoor Lighting has the experience to make sure that your lighting is both secure and beautiful. We have completed thousands of projects for our highly satisfied customers. If you want to make your home more secure and more beautiful, contact us today, and we’ll come out for a free consultation.